Here’s a picture of us a few days later at the Renaissance Faire. Huzzah to new life! The early weeks were just as nerve wracking the second time as they were the first. I worried over the strength of my little embryo knowing I would just have to wait until my 8 week scan to see that things were progressing normally. We wanted to wait to tell our parents until we knew that our pregnancy was viable. That perspicacious Aunt Di and her Uncle Bob! Server: Can I get any drinks started for you? Mom: I’ll have a glass of wine. Me: I’ll just stick with water, thanks. Mom: Oh, you aren’t drinking alcohol? Mom: OMG ARE YOU PREGNANT? Mom: OMG OMG OMG! YOU’RE PREGNANT!!!!!!!!! I can’t believe she didn’t go up to every table individually to tell them she was going to be a grandma again, she was that excited. I believe the word is “bursting.” Her reaction was wonderful and silly and full of love - a perfect example of my mom. She announced that this baby would be called Pickle, in honor of our location, and we celebrated with an extra gooey and delicious s’mores dessert. We asked the server to take our picture. Poor woman didn’t need this much emotion in her life. The next day we rode horses on the beach! Don’t worry, Google said it was fine. Mom learned our happy little secret when I was only 5 1/2 weeks pregnant, which is pretty early and before confirmation of a heartbeat (although I did go to the doctors to have my HGC levels assessed a couple of times, and they were going up at a normal rate). She agreed to keep it to herself until we were ready to make the announcement to the rest of the family. Luckily it was only a couple of weeks later that we heard our baby’s strong heartbeat and began telling everyone else, all in different little ways. My Nana has proudly taken it upon herself to be Roman’s “Napping Station” since he was a teeny tiny baby. To this day she will dutifully hold him in her chair for over 2 hours as he snoozes away, preferring the comfort of her arms to any bed. So to announce Pickle’s arrival we wrote up a contract that extended her napping station duties to include two babies, along with an extra set of muslin blankets. She was thrilled! I just wish I had a picture! 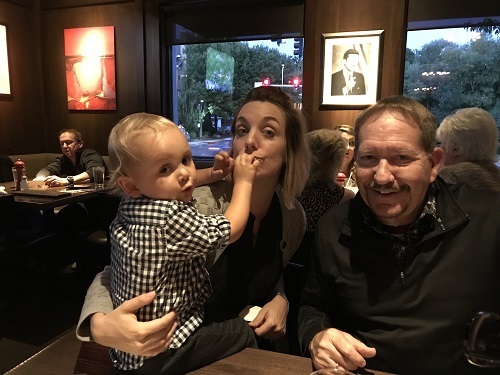 For Troy’s Dad and step-mom we took a casual approach and went for dinner one evening with Roman sporting a “Best Big Brother in the World” t-shirt and waited for them to notice. We ended up having to ask them to read his shirt, but it was a fun way to break the news! With Troy’s mom we had the opportunity to visit her at her beach house in Newport, and we brought with us a card and a small basket of raspberries, since that’s how big Pickle was at the time. I think she was confused at first, but we got there. All weekend and we literally got one blurry picture of my mother-in-law holding Roman. So instead, please refresh yourselves on what raspberries look like. My dad I had to tell over the phone since he lives in Sacramento, but it was still a lovely moment and conversation. We were excited to do a mini gender reveal with him when he came to visit in August. *Side note: Roman bonded to him quickly on that trip, which warmed my heart. Roman can be bashful getting to know people, and that he felt so comfortable so fast with my pops meant a lot to me! During my last pregnancy I had a falling out with my employer (and a resulting firing) which meant I didn’t have to worry about how it was going to affect my career. This time I was in a real office setting , with coworkers and responsibilities, and was incredibly nervous to announce my pregnancy. There were at least three other pregnant ladies in the office at the time and everyone seemed very supportive and excited for them, but then again, they had been there for much longer - I hadn’t even clocked in a year yet! Not only that, but my position was only on contract for one more year, and I was worried that going on maternity leave would limit my chances at a permanent position. So I waited. And almost told my supervisor. But waited some more. As luck would have it a permanent position opened up in July and I got the job! Now I felt guilty that I hadn’t said anything. I was holding onto this big secret all darn summer, and it was making me uncomfortable especially considering the really good rapport I had with my supervisor. Finally one day we were alone in the Cove (as our work space is called) and she starts talking about our coworker who recently went on maternity leave, and I felt like it was now or never so I took a deep breath and started walking to her desk and she yells “You are! Aren’t you?” And I was like “omg yes! I thank you for starting this conversation! I was so nervous!” And she was like “I’ve known for a month! I’m so excited for you, congratulations!” I walked away from that conversation feeling really good, and the support hasn’t stopped. There were no side eyes from my new team when I transitioned positions. I haven’t been excluded from discussions about the future. They made it clear that our department has a “family first” attitude and it has been easy getting help navigating benefits and setting up maternity leave. Based on the horror stories I read on message boards, I’m incredibly grateful to have such an understanding work environment! And I got such a lovely birthday cake! Apparently it wasn’t much of a surprise, she had just gotten back from a trip to France and Spain and had picked up a baby girl onesie from the Guggenheim Museum! She has awesome mother’s intuition!